The book “Capital in the Twenty-First Century” by Thomas Piketty (TP) caused quite a stir in the world of bourgeois economics when it was translated into English last year. It won the Financial Times business book of 2014, has become a best seller and made the author a millionaire. The book contains a wealth of empirical material which TP has painstakingly culled and analysed from tax records in a number of countries for the last two centuries. He has made all this material and his analysis available on line for anyone interested to check. The book, which contains the results of his analysis, is well written, the findings clearly presented and his conclusions provocative. Put in its simplest terms TP finds that inequality is tending to become ever more extreme and that there are no internal mechanisms within capitalism to counter this tendency. If this tendency continues, he argues, it will lead to the poorest 50% of the population expropriating the richest 10%, or, in more simple terms, to social revolution. In the process of reaching this conclusion he successfully refutes both the theory that capitalism is a meritocracy and the trickle-down theory, which holds that if the rich get ever richer it benefits everyone since some of their riches trickle down to the poor. Instead he shows that inherited wealth is, as in the 19th century, far more important than wealth earned by merit and the wealth of the richest in capitalism does not trickle down. TP’s declared aim is to save capitalism from its unfortunate tendencies. To do this he invokes the power of the state and recommends it imposes an annual tax on accumulated capital and a progressive tax on income. The state should then redistribute the revenue in social spending for the poorest 50% of the population and so stave off the revolution. The really striking thing about the debate so far is that the right seems unable to mount any kind of substantive counterattack to Mr. Piketty’s thesis. Instead, the response has been all about name-calling — in particular, claims that Mr. Piketty is a Marxist, and so is anyone who considers inequality of income and wealth an important issue (1). I believe in capitalism, private property, the market (2). Rather than being a Marxist, he is a bourgeois economist in the neo-classical tradition who believes capitalism is the system towards which all previous social systems of production have been evolving. He admitted in an interview with the “New Republic” (3) magazine that he has not even read Marx’s Capital. This makes the title of his book, which clearly echoes Marx’s Capital, and the various attacks on Marx scattered throughout the work, somewhat dishonest. Of the attacks on Marx, an example of particular interest is his rejection of Marx’s law of the tendency of the rate of profit to fall, which he characterises as nonsense, while clearly not having understood it. In fact, TP’s findings confirm many of Marx’s predictions of the dynamics of capitalism, its contradictions and, indeed, validate Marx’s conclusion that capitalism is a historically limited system of production whose contradictions will lead, and must lead, to its replacement. The book is worth reading for this reason alone. TP own position is clearly contradictory though he does not seem aware of this. He freely admits both that the ship of capitalism is heading for the rocks, and that there is no internal mechanism to change its course, while at the same time maintaining there is nothing fundamentally wrong with the capitalist system. The fact that he is forced to look to some external mechanism, namely state action, to avoid the shipwreck he foresees, when there is nothing fundamentally wrong with the system, demands to be explained theoretically. But he does not explain this. This illustrates the principal weakness of the book in that it is a work of empiricism and avoids the theoretical issues which are inevitably raised. In the well-trodden path of neo-classical economics TP considers only the distribution of wealth not its production. TP says, he simply reports what he finds, however, when his findings contradict his own analysis of the empirical data, as in the case of the falling rate of profit, this is not explained. TP’s principal interest is in inequality and this alone explains the book’s success. Its publication was perfectly timed as it followed the “Occupy” movements who raised this issue in their slogan “we are the 99%.” The premise of the movement being that the 1% at the top of capitalism are robbing the rest. The book provides a wealth of empirical material support to this premise and provides an analysis of why the process is not only going to continue but to accelerate. His analysis is beguilingly simple. He divides society into groups determined by either their wealth, which is his word for capital, or their income, and then compares the distribution of both of these amongst the various groups at various historical periods. The divisions he makes are not class divisions and he is careful not to talk about a capitalist class or a working class throughout the book, though these divisions can be inferred. He compares the distribution of capital and income for different times by reducing his variables to ratios. He finds a steadily increasing inequality of capital and income distribution from the Napoleonic wars to 1914. This trend was interrupted by a 30 year period from 1914 to 1945, during which two world wars and a slump strip the upper sections of society of a large proportion of their capital, producing a more egalitarian distribution of capital and income. After 1945, however, the in-egalitarian trend reasserted itself and continues to the present. Table 1 shows his findings (4). It can be seen from Table 1 that income distribution in the USA is now as extreme as it was in Europe immediately before the First World War and on present trends by 2030, he predicts, the top 10% will be receiving 60% of the national income while the share of the bottom 50% will have shrunk to 15%. As mentioned above he notes there is no internal mechanism in capitalism to counter this trend to inequality and if the trend continues the system as heading for social revolution of some kind. Having established that the workings of capitalism inevitably produce this tendency to inequality, TP has also established, though he does not acknowledge this, that such a tendency is only a symptom of the workings of capitalism itself. The problem he concerns himself with is therefore a symptom of more fundamental problems in the system itself. One might expect TP to examine or at least discuss these problems. Of course, he does not do this. Such an examination would, inevitably, lead to an examination of production itself and, consequently, the production of profit. For TP profit is something eternal which capital produces like “the attribute of pear trees to bear pears” (5). TP, consequently, restricts himself to the problems of distribution. To avoid revolution distribution must be controlled by the state. He, therefore, prescribes treatment, not of the cause of the problem but of the symptom. It is worth looking at TP’s analysis which his bourgeois detractors have so far failed to disprove. He also considers the return on capital which he calls r. This is not the rate of profit in Marx’s sense because of his definitions of capital and income. where s = the rate of savings, and g is the rate of growth. α = r*β = (r *s)/g. means the share of the social product going to capital must inexorably rise. He finds his rate of return on capital, r, is fairly constant at 4.5%. If the average growth rate is 1%, which current trends indicate is likely, α is about 55%. This means that the income going to those who do not hold capital, will drop to 45%, and lower growth could see it dropping further. As mentioned above, he predicts on current trends in the US, the poorest 50% will receive only 15% of the total income by 2030 and there is no reason why this will not be the case in Europe and elsewhere. If we remember that the text book assumption, for neo-classical economics is that 67% of the social product goes to the working class, one can understand why TP thinks this will lead to revolution. This is also why the book has been subject to such a hue and cry in bourgeois economic circles. How do TP’s findings relate to Marxist economic analysis? To answer this we need to briefly restate Marxist laws of capitalist production and crisis theory. c = constant capital represented by raw materials, machinery buildings etc. This is reproduced by past labour in the production process and adds no new value to production. v = variable capital represented by labour’s wages. It is called variable because workers produce not only their wages but a surplus, s.
During a cycle of production there are also necessary transformations from money to commodities. The money capital from the earlier cycle of production is transformed into raw materials and instruments of production at the start of the new cycle and a part used to buy labour power. After production the values c + v + s are incorporated in the products of productions and must be sold to produce money capital so the cycle can start again. For expanded production part of the surplus value is converted into additional constant and variable capital. This leads to accumulation of capital and production on an ever increasing scale. Marx called the ration s/v the rate of surplus value, or the rate of exploitation of labour, and c/v as the organic composition of capital. Marx noted that as capitalism developed and accumulation of capital took place the value of the constant capital, c, rose faster than that to the variable capital, v. This led to a tendency for the organic composition of capital to increase and for the rate of profit to fall. The organic composition is thus the principal determinant of the rate of profit. There were, however, counter measures which capital could take to reverse this fall. One was to increase the rate of exploitation s/v, another was to cheapen the elements of constant capital and thereby reduce the organic composition c/v. Marx argued that in the long term these counter-measures would prove ineffective in halting the tendency for the rate of profit to fall. This was because there are physical limits to increasing the rate of exploitation, even if the working day is extended and the productivity of labour is increased a worker still needs to work part of the day for himself and his family in order to reproduce his labour power. Also, in respect to cheapening the elements of constant capital, Marx noted that though individual elements of capital equipment may become cheaper generally they become incorporated with new systems of production which contain greater value. For example, though computer controls are much cheaper than a few decades ago they are now incorporated in robots and computer controlled assembly lines etc. which contain far more value than the systems they replace. Despite cheapening of elements of constant capital overall there is an increase and the organic composition of capital rises. Falling profitability and the competition it engenders leads to a constant drive for capital to accumulate which in turn requires a perpetually increasing supply of surplus value. In Marx’s view the falling rate of profit would lead to a situation where insufficient surplus value is produced for accumulation, or valorisation, of existing capital values. This would produce an economic crisis. The problems of capitalism are thus located in the system of production itself. They are internal and endemic to the system and can only be solved by replacement of the system itself. They cannot be solved by a different organisation of production such as neoliberalism, state-capitalism, the mixed economy with partial state control or other variants as TP suggests. How do Piketty’s findings relate to Marx’s analysis? As mentioned above the first principal way Marx identifies of combating the falling rate of profit is through an increase in the rate of exploitation. There are two ways of doing this. The first is to increase what Marx termed the rate of “absolute surplus value” which involves lengthening working time or reducing wages while maintaining productivity constant. The second is increasing the rate of “relative surplus value” through increasing productivity by means of more productive machinery or more efficient organisation of labour without increasing the length of the working day or reducing wages. The strategy which capital adopts generally depends on the rate of growth of the economy, or in other words the rate of accumulation of capital. It follows therefore that in proportion as capital accumulates, the lot of the labourer, be his payment high or low, must grow worse. The law, finally, that always equilibrates the relative surplus population, or industrial reserve army, to the extent and energy of accumulation, this law rivets the labourer to capital more firmly than the wedges of Vulcan did Prometheus to the rock. It establishes an accumulation of misery, corresponding with accumulation of capital. Accumulation of wealth at one pole is, therefore, at the same time accumulation of misery, agony of toil slavery, ignorance, brutality, mental degradation, at the opposite pole, i.e. on the side of the class that produces its own product in the form of capital (7). the immediate driving power of history, and in particular the class struggle between bourgeoisie and proletariat as the great lever of the modern social revolution (8). Although TP’s empirical study confirms the effects of what Marx called “the general law of capitalist accumulation” he still denies that Marx’s theoretical analysis has any relevance whatsoever! The second principal way Marx identifies of reversing falling profit rates is the devaluation of constant capital and thus the reduction of the organic content of capital. TP’s ration β is a rough approximation of Marx’s organic content of total capital. TP shows that this ratio dropped from approximately 7 in 1914 in both France and Britain to approximately 3 in the period 1914 to 1945. This was brought about by complete failure to replace used up capital during the periods of war when competition was suspended, by the physical destruction of capital in warfare and by bankruptcies and inflation during the interwar slump. This devaluation of real capital was reflected in the financial sphere. The effect of inflation on financial assets such as Government bonds between 1914 and 1950 was dramatic. In France their values were reduced by a factor of 100 whereas in Germany the factor was 300. In the UK and USA the reduction factor was 3, less extreme but still significant (9). A whole section of interest yielding fictitious capital was thereby wiped out. The ICT has consistently argued that it was the devaluation of capital during the period of the Second World War which laid the basis for the spectacular expansion of capital accumulation in the 30 year period following the war. The data TP as assembled confirms this. TP, however, treats the world wars and the slump as external shocks to the capitalist system that come out of the blue. In fact, they result from tendencies in capitalism, namely imperialist competition, and are expressions of the inherent struggle for surplus value. They result from contradictions and problems of the system as a whole. For TP the events of 1914 to 1945 appear as “deus ex machina” the effect of which is to usher in what we call the post-war boom and the French call the “Trente Glorieuses”, the period of 1945 to 1975. Despite his lack of theoretical interest in why these events took place his empirical findings confirm that the period 1914 to 1945 produced a massive devaluation of existing capital values. Since TP finds his ratio β tends to constantly increase, which implies that the constant capital is increasing faster than the variable, thereby increasing the organic composition of capital, one would expect him to find a decreasing rate of profit. He categorically denies this. Although he finds the rate of profit falls from the 1950s when it is about 11% to 4.5% in 2010, over the 200 year period this appears as an anomaly. He finds a steady rate of profit of between 4% and 5% for the last 200 years. The equations he relied on to show the increase in equality, however, also predict a fall in the rate of profit. His rate of profit, r, is equal to α/β, with α and β defined as above. He admits that less highly capitalised economies, i.e. with β smaller, would have a higher rate of profit as in Marxist analysis. If we look at the way the ratio α/β changes with accumulation it is clear that the value β determines the relationship. Although α can be increased to a certain extent the share of total income going to workers cannot be reduced indefinitely. This is the same argument Marx used for the limits to increasing the rate of exploitation. However, TP’s data show the trend is for β to increase steadily just as Marxist analysis would expect. β then controls the rate of profit and as β increases we would expect a tendency for the rate of profit to fall. and accept TP’s finding that “s” is constant at about 12%, then the rate of growth, “g”, determines the ratio β. As the rate of growth decreases β increases and hence from TP’s equation the rate of profit should fall. Yet TP maintains it has been constant at approximately 4.5% since the Battle of Waterloo. From TP’s own equations it is clear that the rate of profit could only be constant if β increased as α increased. According to TP this could only occur with a steadily increasing growth rate. The fact that this is not happening is, of course, one of his prime concerns running through the entire analysis. One would think that for someone who placed so much faith in his equations for confirming inequality he would explain this contradiction but he does not even seem interested in this. Instead of confronting why his equations predict that the rate of profit should fall he finds empirically it does not. He simply repeats the standard neo-classical view that the return on capital is equal to its marginal productivity. This is merely a way of escaping from the contradictions into which his analysis has led him and illustrates the bankrupt state of bourgeois economic theory. It is, however, worth demonstrating how the theory of marginal productivity is a camouflage for capitalist exploitation. TP does not, of course, concern himself with theoretical issues, in particular how his constant 4.5% profit is produced. Bourgeois economics, or political economy, began as a critique of feudalism and as a weapon of the rising bourgeois class. It showed that wealth was created by labour and exposed the wastefulness of feudalism and the parasitic nature of the aristocracy. From the start this critique attempted to found itself on science and gave itself a materialist basis in the labour theory of value. However, as the class antagonism of bourgeois society emerged as one between labour and capital, and bourgeois economic theory showed that the wealth of society was created by labour, the theory became positively embarrassing. It meant that all the wealth of society was created by the working class including profit, interest and rent. Moreover, it meant that capital itself was only accumulated labour extracted from the working class in previous cycles of production. Capitalism was challenged in practice by a working class demanding more of the social product which bourgeois theory clearly admitted it had created. As Marx notes in the introduction to Capital, this sounded the death knell of bourgeois political economy. It was thenceforth no longer a question, whether this theorem or that was true, but whether it was useful to capital or harmful, expedient or inexpedient, politically dangerous or not. In place of disinterested inquirers, there were hired prize-fighters; in place of genuine scientific research, the bad conscience and evil intent of apologetic (10). Marginal utility of 1 slice of bread to a family that has only 7 slices will be great since the family will be less hungry, the difference between 7 and 8 is proportionally significant. An extra slice of bread given to a family which has 30 slices will have less marginal utility since the difference between 30 and 31 is proportionally smaller. Thus the marginal utility to a buyer of a product decreases as he purchases more and more of the product until the point is reached where the marginal utility is zero (11). Marginalism takes its departure from the needs of individuals. The evaluation of these needs is an affair of human consciousness and thus subjective. Exchange value and use value … are only different forms of the general phenomenon of subjective evaluation. … The point on an individual’s scale of satisfaction, at which the desire for a good is satisfied determines that good’s marginal utility and thereby its value (12). This theory was, in Marx’s term, “useful” in that it justified profit and interest. Capital, land and labour became factors of production each with their own marginal utility. Capital has a marginal utility manifested in profit. Labour has a marginal utility in workers’ marginal propensity to work or to defer consumption. The market price of labour was, accordingly, determined by its marginal utility and, of course, the price of labour was equated with its value. Consequently exploitation of labour through the difference between the exchange value of labour power and its use value could now also be denied. Exploitation has conveniently vanished, and profit, interest and rent have become equivalent to wages, while the existing distribution of the social product is justified. This theory thus perfectly justified the existing capitalist property relations. Once values of commodities were determined subjectively, economic questions could be reduced to those of exchange. The problem of relating value to price and accounting for distribution could be ignored. Prices were all that mattered and distribution was regulated by price. Marginal analysis assumed a multiplicity of subjective choices would establish an equilibrium of supply and demand and needs would be satisfied. It appeared that at last bourgeois economics had found a way of proving Say’s law, namely that supply is always equal to demand, was true. The problem of economic crises, however, remained unexplained theoretically. Instead of seeking a theoretical explanation for the fact that the equilibrium which the theory predicted, did not in fact exist, bourgeois economics concentrated on empirical studies of market relationships and the business cycle and complicated mathematical models. TP maintains he is simply analysing facts and reporting what he finds. He consequently ignores the theoretical questions arising in respect to the production of wealth. His 4.5% return on capital is simply the marginal productivity of capital which is subjective and we are told is a “time preference.” But this is not an explanation at all. It is the neo-classical refusal to analyse where value comes from. TP has no understanding that capital, labour and profit are in reality social relationships and profit is derived from the exploitation of labour and will disappear if these social relationships change. TP is aware of Marx’s law of the tendency of the rate of profit to fall but denounces it as nonsense. Marx, he claims, ignored increases in productivity (13) which in his view keep the rate of profit steady. Marx did not, of course, ignore increases in productivity and such a claim can only arise from complete ignorance of his works. One of the counter tendencies to the falling rate of profit outlined by Marx and discussed above is the increase in the rate of surplus value, which generally depends on the increase in productivity. Marx coined the term relative surplus value to describe the increase in the rate of surplus value resulting from increased productivity. Moreover Marx showed that increases in the productivity of labour tend, in the long term, to reduce profitability not to increase it as TP imagines. This is because they entail replacement of workers in the production process by machinery. This is a process of replacing living labour, workers, by dead labour, machinery, and since living labour is the only source of surplus value the amount of surplus value is reduced as the number of workers decreases. Therefore the amount of profit relative to capital decreases. While it is true that individual capitalists who introduce more productive machinery can experience an increase in profits, this is temporary and will vanish as their competitors install similar equipment. For the system as a whole the amount of surplus produced relative to the capital employed falls. This produces a fall in the rate of profit. TP defines capital as anything which can be exchanged on some market. Capital includes all forms of real property (including real estate) as well as financial and professional capital (plants, infrastructure, machinery, patents and so on) used by firms and government agencies (14). All these produce, profits, interest, rent, royalties and so on, which TP lumps together in his rate of return on what he calls capital. This is simply how things appear to the bourgeoisie. In reality all profit is produced by exploitation of living labour, that is to say productive workers. This profit is then divided up in various ways and distributed between industrial capital, financial capital, property, government bonds etc. The real rate of profit should therefore, as Marx explains, be calculated on the basis of productive capital only. This will, of course, produce a much higher rate of profit than TP discovers. But can a Marxist rate of profit be derived from the economic statistics produced by the bourgeoisie or from TP’s own figures? Although capitalist economic statistics do not directly relate to Marxist categories, attempts have been made by a number of researchers to use bourgeois data to produce a Marxist rate of profit. 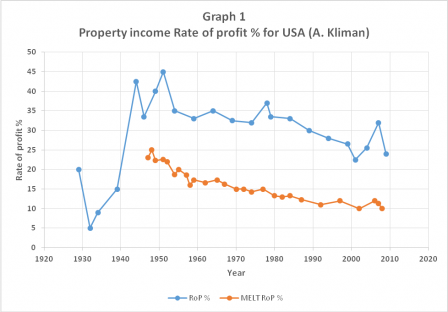 Andrew Kliman (15) compiles what he calls a “property income” rate of profit for US capital from 1929 to 2009. This is a rate, in terms of prices, before deductions of tax, interest, rents, fines, gifts, and other transfers and is based on the historical value of the constant capital. It excludes circulating capital, including wages, which get used up and replaced in the number of annual cycles of production. Although this is an omission, which will lead to a higher rate of profit, it is not a significant one and does not affect the long term trend. The number of annual cycles of production has been steadily increased since the Second World War by increasing productivity. This is a way of increasing profits. Since each cycle regenerates the circulating capital, including wages, the annual expenditure on wages and all circulating capital is reduced. Research on the economies of Netherlands and Japan, by E Maito, has shown that whereas the average number of annual cycles of production in 1965 was 5 by 2005 it had risen to 12 (16). This means that only a twelfth of the annual wage costs should be considered as variable capital. 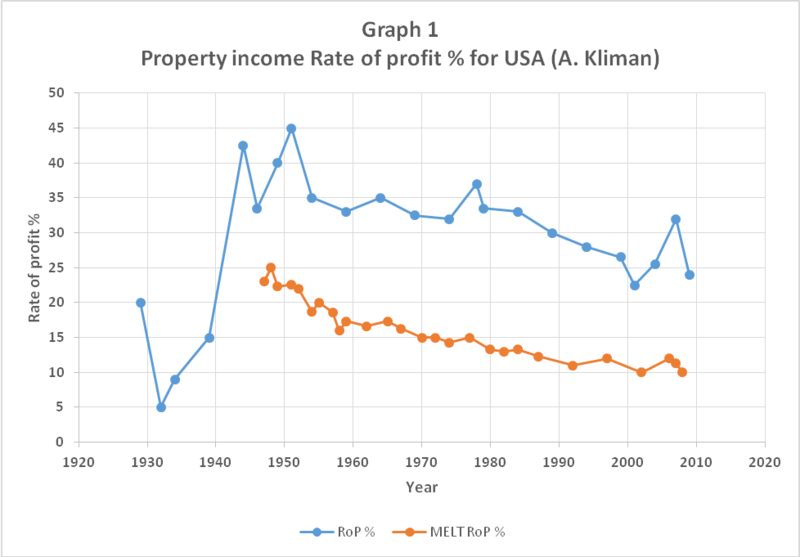 In an attempt to produce rates of profit in terms of values A. Kliman produced a property income rate of profit based on labour time. He arrived at this by dividing prices by the annual Monetary Equivalent of Labour Time (MELT). This reduces prices of capital, wages and profits to labour time thereby eliminating the effects of inflation and state manipulation of the money supply. This is nearer to the rate of profit Marx speaks of in Capital. These results are, of course, approximate but they do indicate trends. Andrew Kliman’s results are shown in Graph 1 below. From the unadjusted property income rate of profit, which is in terms of prices, two key issues can be seen. The first is that the slump of the 1930s and the war produced an enormous increase in the rate of profit and the second is that from the post war period onward the trend is for the profit rate to fall (17). The MELT property income rate of profit, which is calculated in terms of labour time, but excludes taxes, interest payments etc. as mentioned above, shows a more modest profit rate but still a clear tendency to decline (18). E Maito has carried out a similar analysis, though on a more global scale. He has calculated profits on fixed capital, but used replacement costs for fixed capital. He has done this for what he calls “core” capitalist countries and for “peripheral” countries. The core countries he includes are, USA, Netherlands, Japan, UK, Germany and Sweden, while the peripheral countries are, Argentina, Australia, Brazil, Chile, China, Korea, Spain and Mexico. He estimates these countries represent about 58% of the global economy. The world rate of profit is an average weighted in respect to constant capital. His results are shown in Graph 2 below. As with Graph 1, Graph 2 (19) shows the effect of the 1930s slump and World War 2 was to raise the rate of profit but thereafter the falling trend reasserts itself. The higher rate of profit in the peripheral countries has raised the global rate but again the downward trend remains. 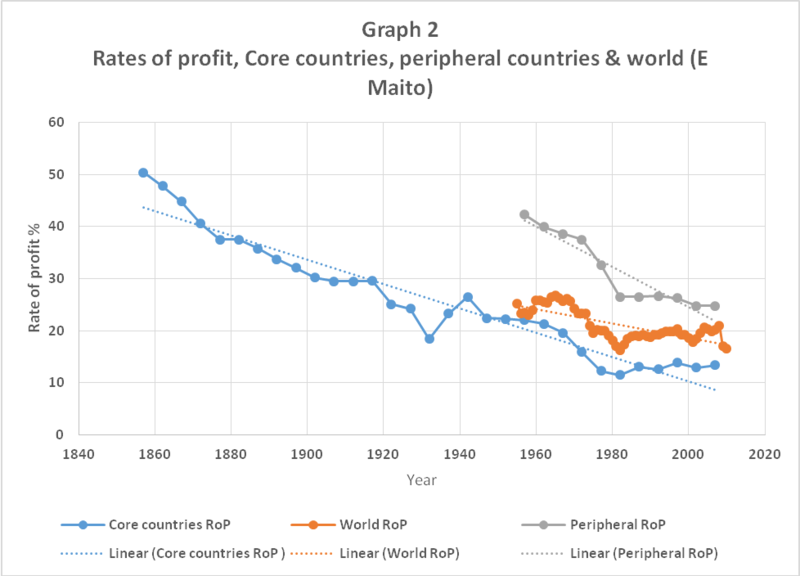 The rate of profit in the peripheral countries though higher than that in the core countries tends to fall more steeply. 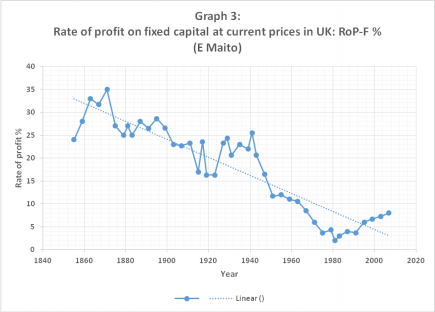 Using TP’s data for the income split between capital and labour and the UK Office of National Statistics, Maito has also calculated a similar graph for Britain from the mid-nineteenth century to the present. This is shown below as Graph 3. 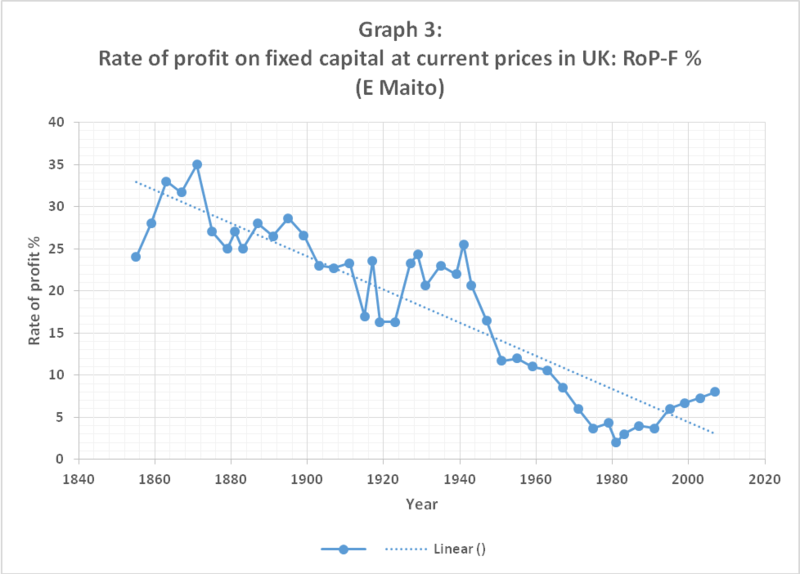 Graph 3 (20), which shows the rate of profit on fixed capital for Britain and once again shows the effect of World War 1, the slump of the 30s and World War 2 was to raise the rate of profit. 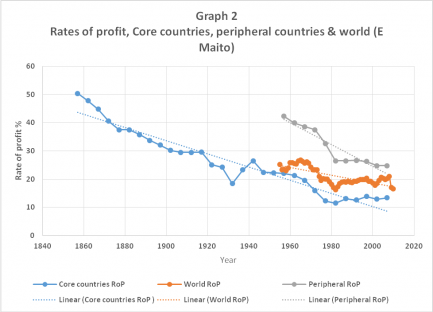 Before World War 1 and after World War 2 there is a clear downward trend to the rate of profit. in every respect the most important law of modern political economy (21). This is the underlying dynamic of a productive system whose problems tend to appear first in the sphere of circulation. This includes, of course, the 2007 “great recession”. The instability of the system and the tendency to crisis are derived from this tendency. 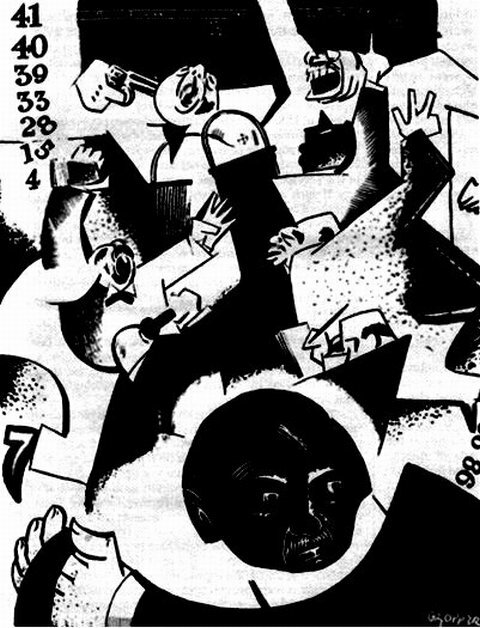 The problem of inequality, which TP imagines he has discovered, results from continual and ever increasing accumulation of capital in the hands of the capitalist class. This inevitably directs more of the social product into their pockets. Accumulation of capital, in turn, results from falling profitability of capital which demands more productive machinery and increases in the scale of production. Thus inequality can be traced to falling rates of profit, that is to say problems in the production of surplus value. These problems result, as we have shown, from the value composition of capital and are endemic to the system. However TP imagines that such internal tendencies in the sphere of production can be controlled by the state. Marxism understands that states are products of class society. In capitalist society this means the state is an expression of capitalist society and capitalist production relations. Although the state does act as a manager and organiser of civil society, and acts in the interests of the dominant section of the capitalist class, it cannot alter the laws and tendencies of capitalist social relations of which it is itself only an expression. In particular it cannot prevent the tendencies towards, concentration and centralisation of capital nor can it control the fall in the rate of profit, which in turn controls investment or capital accumulation and thus inequality. The German Workers Party – at least if it adopts the programme – shows its socialist ideas are not even skin-deep; in that, instead of treating existing society (and this holds good for any future one) as the basis of the existing state (or of the future state in the case of future society), it treats the state rather as an independent entity that possesses its own intellectual ethical and libertarian bases (23). In the 150 years since Marx wrote these words, which, needless to say, fell on deaf ears, we have seen continual attempts by states to control capitalism’s inherent tendencies and all have failed. The failure of state-capitalism in Russia is the most significant example, since the entire state apparatus was mobilised for this purpose, but the failures of post-World War Two “Social democracy” in Europe are no less significant. The theoretical bases of these attempts such as Stalinism, Keynesianism or monetarism have in their turn been undermined. TP does clearly not consider that the theoretical bases of these theories have been undermined. He seriously thinks that the state could regulate distribution of the social product in favour of the poorest half of society while capitalist social production relations while remain intact. TP traces the influence of the state on capitalism through the last 2 centuries by looking at taxation and the proportion of the GDP consumed by the state. He finds that up to 1914 the advanced capitalist states consumed less than 10% of the GDP and carried out only what he calls “regalian” functions of policing, justice, defence and general administration. The period 1914 to 1945 produced a sea change and today these states consume 40% to 50% of GDP. This is spent principally on health, education and transfer payments. Yet TP finds that over the period from 1914 to the present there has been no significant difference to the position of the poorest 50% and that massive inequality not only persists but is increasing. What TP wants is for the state to increase taxation of capital and the income of capital and transfer this to the poorest in society through further transfer payments. In other words TP demands that the measures which have failed over the 60 years should be reapplied but with more vigour. J S Mill considers bourgeois relations of production as eternal but their forms of distribution as historical, and thereby shows that he understands neither the one nor the other (25). The prevailing distribution of the means of consumption is only a consequence of the distribution of the conditions of production themselves (26). It is obvious that under capitalist relations of production the owners of capital are the owners of the surplus value extracted from the working class. While it is, of course, true that the state could tax this income it is an axiom of Marxism that the owners of capital are also the controllers of the state and, in general, use the state to protect their capital and income. TP is aware of this but sees it as some sort of anomaly which could be solved by “democratic” control of the state. This is the enduring fantasy of Social Democracy which no amount of empirical contradiction can shake. However, even TP himself admits that his solution is utopian, not for the reasons listed above, but because the world is divided into competing states and his proposed measures would need to be global otherwise capital would simply move to lower tax countries, in the way it does now. He looks to some system of world government or at least a situation where the hegemonic states could force such a redistribution of capital and income on all other states, but is realistic enough to recognise that this will not happen. One consequence of increasing inequality was virtual stagnation of purchasing power of the lower and middle classes (27). TP sees the problems of capitalism as in the market and that these could be solved by increasing effective demand through the well-tried methods of Keynes. These methods were finally discredited in the 1970s when Keynesian stimulus led only to inflation and raising of interest rates by the central banks led only to stagnation or recession. The use of the state to control the internal tendencies of capitalism has been successful only in attenuating the worst effects, and propping up the system when it totters on the brink of collapse as in the banking collapse of 2008. Its actions over the last 40 years have turned the current downward phase of the cycle of accumulation into the longest in capitalist history. But the state cannot overturn “the immanent laws of capitalist production” as Marx put it. All the contradictions and tendencies of capitalism remain intact and will, in due course, assert themselves again in yet another crisis which may be closer than its supporters think. TP’s study exposes the concern of bourgeois economists about the state and the trajectory of capitalist society. Sections of the bourgeois intelligentsia really do see the ship of capital as heading for the rocks and think something needs to be done urgently. While an empirical study such as TP’s provides a wealth of data to show that this is the case, bourgeois economic theory is unable to understand the causes behind this and hence its proposed remedies will remain ineffective. All this simply exposes the bankrupt nature of bourgeois economic theory. The forces driving capitalism to its destruction lie in the sphere of production and can only be understood on the basis of the labour theory of value which bourgeois economic theory has long since rejected as too embarrassing. Consequently TP’s prescriptions for restoring capitalism to its halcyon days are a waste of time. The fact that TP treats slumps, crises and wars as external factors and not effects which arise from the workings of the system itself, is a refusal to account for these theoretically. The recurrent nature of crises and the instrumentality of wars in restoring profit rates, point to the historical and therefore limited nature of capitalist production. Although he is not aware of this TP’s study indirectly confirms this. What is needed is the replacement of the capitalist system of production by a socialist one in which the means of production are made common property and all labour becomes social labour. Until this happens the system will lurch from crisis to crisis and symptoms of its internal contradictions, such as inequality, will continue to grow more extreme. (6) The text book figure for the split of income between capital and labour is 33% to 67% respectively. (9) Thomas Piketty “Capital in the 21st century” p. 107. (10) Marx Capital Volume 1 Afterword to the 2nd German edition.